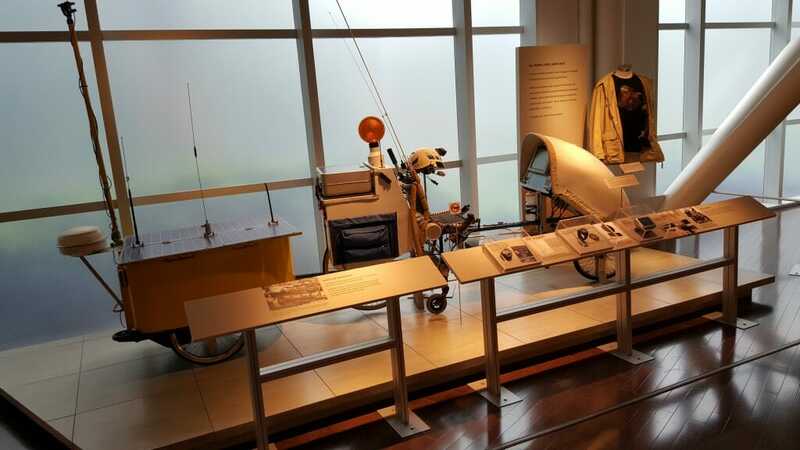 The long-term home for the bike, after 17,000 miles of adventure and hundreds of stage appearances in the years that followed, is the Computer History Museum in Silicon Valley. I love this place, and it’s truly worth a visit for lots of reasons besides BEHEMOTH… they have astounding treasures from all branches of the computer world. The photo here is the bike in their Revolution exhibit, and the text following is from their CORE publication. In the early 1980s, feeling trapped in his suburban lifestyle, Steve Roberts began to reevaluate his life. Roberts, a freelance technical writer who had published articles in magazines such as Byte, decided to tour the country on a recumbent bicycle of his own design, the Winnebiko. 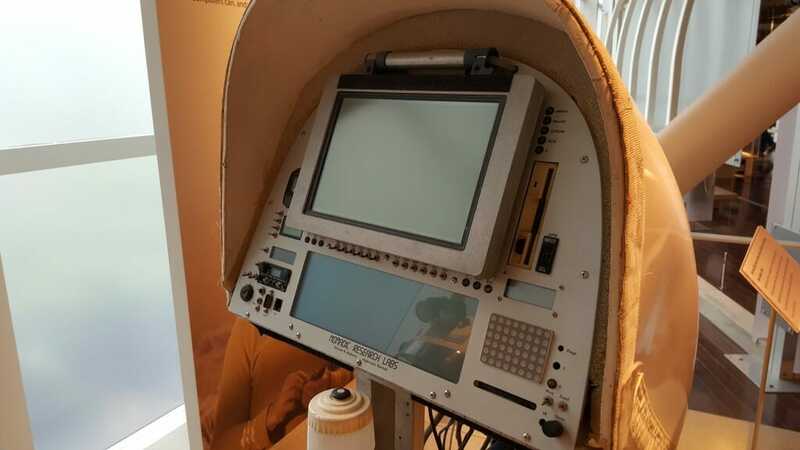 During his trip, Roberts made his living publishing stories and writing a book as he went along, using his on-board Radio Shack TRS-80 Model 100 and a CompuServe account to email his stories to publishers. 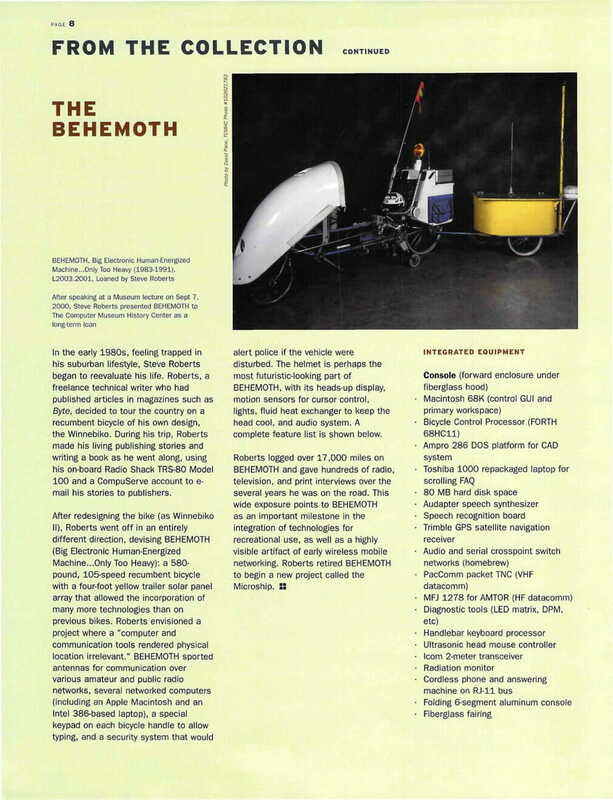 After redesigning the bike (as Winnebiko II), Roberts went off in an entirely different direction, devising BEHEMOTH (Big Electronic Human-Energized Machine…Only Too Heavy): a 580-pound, 105-speed recumbent bicycle with a four-foot yellow trailer solar panel array that allowed the incorporation of many more technologies than on previous bikes. Roberts envisioned a project where a “computer and communication tools rendered physical location irrelevant.” BEHEMOTH sported antennas for communication over various amateur and public radio networks, several networked computers (including an Apple Macintosh and an Intel 386-based laptop), a special keypad on each bicycle handle to allow typing, and a security system that would alert police if the vehicle were disturbed. 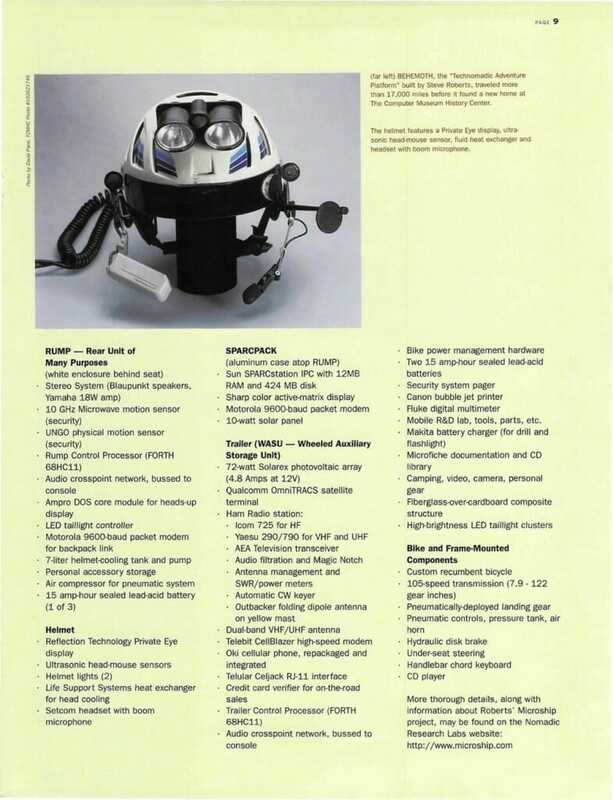 The helmet is perhaps the most futuristic-looking part of BEHEMOTH, with its heads-up display, motion sensors for cursor control, lights, fluid heat exchanger to keep the head cool, and audio system. A complete feature list is shown below. Roberts logged over 17,000 miles on BEHEMOTH and gave hundreds of radio, television, and print interviews over the several years he was on the road. This wide exposure points to BEHEMOTH as an important milestone in the integration of technologies for recreational use, as well as a highly visible artifact of early wireless mobile networking. Roberts retired BEHEMOTH to begin a new project called the Microship. 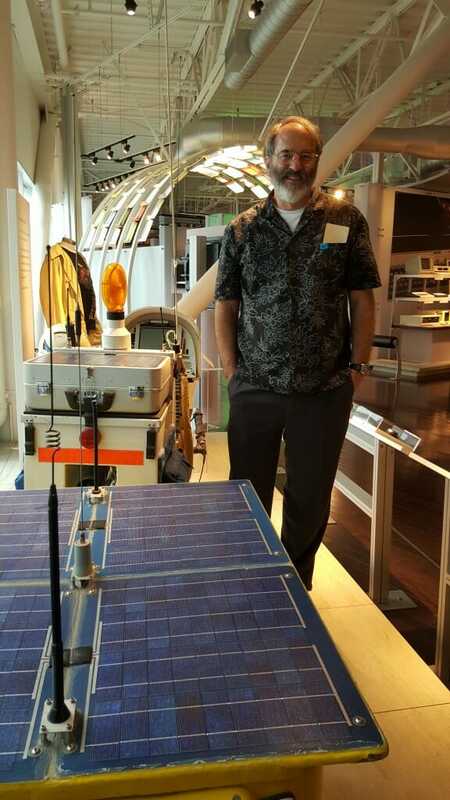 More thorough details, along with information about Roberts’ Microship project, may be found on the Nomadic Research Labs website. Note from 2018 – there is a delightful post on the Japanese Critical Cycling blog (October 2017) about seeing BEHEMOTH in the museum… click the pop-up to translate!